A seven-question online survey was fielded by the Crown Hill Urban Village Committee for Smart Growth between July 7 and August 5 of 2016. The survey asked respondents to rate specific questions on a scale of 1 to 5, then offered three response opportunities for write-in concerns. A total of 517 open-ended comments were submitted, and are viewable verbatim here. While many neighbors expressed deep concerns, frustrations, anger and uncertainty about their future when commenting about the City’s proposal to upzone Crown Hill Urban Village and expand the boundaries further into the neighborhood, many also conveyed thoughtful ideas and articulate suggestions and concerns as they envisioned a quality future for our neighborhood. Building on arterials and areas already zoned but underutilized first. A supermajority of all respondents strongly agreed that Seattle needs more affordable housing, but that affordable housing policies should also protect existing affordable housing, so renters in single family homes are not displaced by expensive new town homes. Renters responded much more strongly in favor than homeowners to this question. Overwhelming majorities agreed that future needs should include better and safer pedestrian access in and around arterials and better transit opportunities to connect with light rail at Northgate. They also expressed strong support for adding green space, protecting trees and open spaces, planning to make sure small and locally owned businesses have space within new developments along arterials and developing a vibrant business center for CHUV, and working with Seattle School District to accommodate new growth. Overall, the survey findings suggest a strongly engaged community that seeks to plan for growth while improving and strengthening existing infrastructure and services to accommodate new neighbors while supporting existing renters and homeowners. 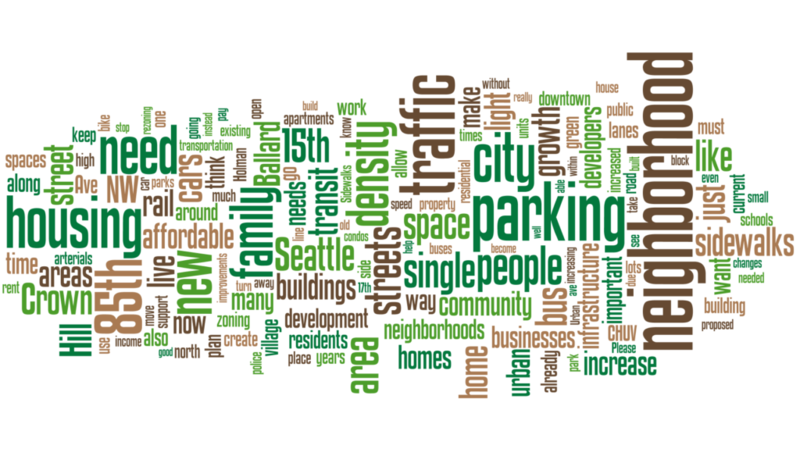 Five-hundred-and-seventy-five (575) neighbors completed the survey. Of those, sixty-one (61) percent live in the Urban Village or Proposed Expansion area; with thirty-four (34) percent indicating they lived just outside the expansion area. Eighty-four (84) percent of respondents were property owners and fifteen (15) percent rented their homes.